The seminar will take place, the 16th of November 2017, at 11am, at the ENSCBP amphitheater, Building B, allée Geoffroy Saint-Hilaire, Pessac. One of my major research interests is development of synthetic ion channels with capabilities of stimuli-responses and functioning in biological media. Among many synthetic ion channels developed since early 1980s, my original design is to build the channels by supramolecular assembly of rigid membrane-spanning components. This structural motif is inspired by nature, namely multipass transmembrane (MTM) proteins with assembled membrane-spanning alpha-helices. A multiblock amphiphile consisting of hydrophobic aromatic units and hydrophilic flexible PEG chains allows for folding to form an MTM-mimicked conformation in a lipid bilayer. This foldamer in a membrane performs ion transportation by the formation of a synthetic ion channel (ChemComm 2011, JACS 2012). More recently, the first totally-synthetic ion channels responding to organic ligands and mechanical stress have been successfully demonstrated (JACS 2014 and 2017). 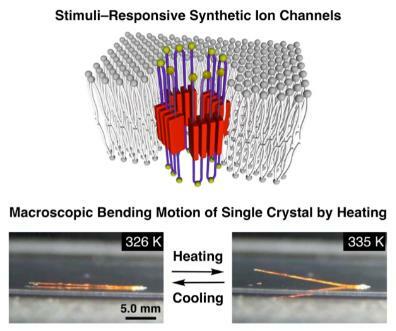 During the researches relating to the ion channels, a multi-block amphiphilic macrocycle was synthesized, which shows thermo-responsive single-crystal-to-single-crystal transition with macroscopic bending motion (Angew. Chem. 2014). X-ray crystallography revealed a thermoresponsive conformational change at the PEG chain triggers the polymorphism.